Robert Johnson, at right, who only wanted to be identified by his middle names, looks over his work inside the tent at the pop-up safe injection site at Moss Park in Toronto, Canada on October 3, 2017. 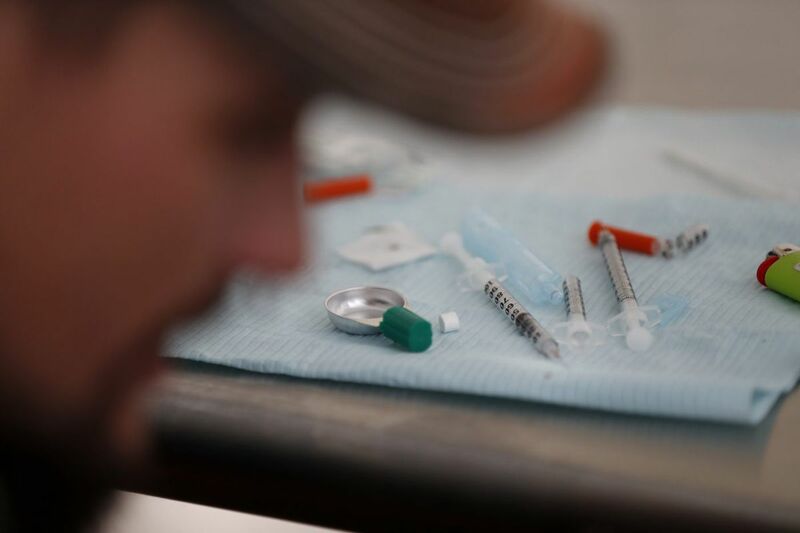 This week, Philadelphia officials announced their support for safe injection sites in the city, to be run by private and nonprofit organizations. Because the issue is controversial, we consulted our northern neighbors in Canada who were the first in North America to open these sites for a sampling of the debate. Read what two Toronto doctors have to say about safe injection sites for another view on this issue. While patients with type 1 diabetes struggle to have peace of mind to have their medical supplies covered, Toronto is giving away needles and syringes for drug users at supervised injection sites. The Ontario Health Insurance Plan and the Ontario Drug Benefit do not cover pen needles, syringes, or lancets. Clearly, the province's priorities are skewed if establishing injection sites is prioritized ahead of a broader pharmacare program. In light of the opioid and fentanyl crisis across Canada, the Ontario government – under the leadership of Premier Kathleen Wynne – and Mayor John Tory have thoughtlessly and recklessly established and expanded injection sites across Toronto. Even months prior to the opening of an official site, the police and political leaders refused to take any action to dismantle a rogue, pop-up site at Moss Park – mere steps from a playground and a community centre where children play hockey. Rather than provide real and meaningful action to help people with addictions to recover and reclaim dignity in their lives, our governments have chosen to enable further drug abuse. Caused serious harm to the economy and its consumers. The City of Toronto and Ontario government have opted to enable very dangerous and disruptive behavior. They ignored the role that organized crime plays in supplying illegal drugs and the fact that many addicts themselves commit crimes to get the money they need to acquire drugs; they turn a blind eye to the fact that drug use is not a victimless crime. We as a society do not condone or facilitate any other criminal activity. We don't provide free internet for those who want to hack secure servers. We don't offer masks to bank robbers or switchblades to violent offenders. Yet, both levels of government have explicitly displayed the endorsement of narcotics and soft-stepped around even more bizarre suggestions like legalizing heroin. Expanding injection sites throughout Toronto and Ontario will only further drug abuse. Drug abuse is not a victimless crime, and it destroys the lives of people with addictions, their families, and other loved ones. Toronto has and is still waiting for meaningful funding toward treatment and counseling. This is a public health emergency. We need to save lives. The experiences in Vancouver's Downtown Eastside and in Toronto next to Dundas Square and St. Michael's Choir School have shown that these sites don't work. The surrounding parks, public spaces, and businesses have become degraded and littered with needles. Rather than offer real help to those who are suffering from mental-health issues and addictions, we see that our municipal and provincial governments lack strong leadership. Preventing future deaths requires decisive and bold action to meaningfully fund treatment and rehabilitation immediately. This is not just a city issue. The provincial and federal governments – with their substantial budgets – need to step up to the plate and offer real treatment options that do not put communities at risk.